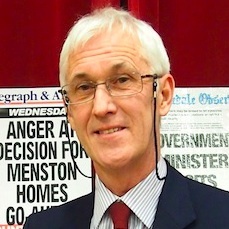 Steve Ellams, Chairman of the Menston Community Association (MCA), has tendered his resignation from the post with immediate effect in a letter to the committee circulated by email yesterday evening. You can see the text of the letter in full, published on the Menston Community Association section of this website, by clicking HERE (or click the MCA ‘button’ in the right sidebar). Steve has been a loud and effective voice in the battle to preserve for the Menston community what makes this village what the recently-formed Menston Business Association has said is ‘The best village in Yorkshire’. It is no wonder that he is “exhausted mentally and physically” and it is time for someone else to step up to the plate. Earlier this year I commented on the dearth of women and people from younger generations in both the committee running the MCA and in the Menston Parish Council (MPC). The Chairman and other officers of the MPC just last week re-elected themselves to their current positions. With the high proportion of elderly people in the village it is certainly right that they are well represented in both the MCA and MPC, but the balance is not right: more younger people are needed. A higher proportion of women is also needed in the running of both these organisations, especially as they are largely responsible for the success of so many groups and charitable organisations in the village. During the next few months there will be the opportunity to bring this about. The AGM of the MCA, with election of officers, is due in November this year, and there should be an election of the Parish Council in 2015. There will of course be objections to the latter – there is a financial cost and people have said that there is no-one willing to step up. But were they ever given the opportunity? Not as far as I can ascertain. It requires only 10 residents to request an election, and of course some people willing to be nominated. I find it difficult to believe that neither of these requirements can be met. If the Menston community do nothing or always vote for what they’ve always voted for, they’ll always get what they’ve always had. Unfortunately this is only true in some respects. Bradford Council is intent on taking away some of the things they’ve always had – their green fields for a start. This entry was posted in grumpytyke, Menston Community Association, Menston Parish Council and tagged community, grumpytyke, Menston, Menston Community Association, Menston Parish Council, Menston website. Bookmark the permalink.